Antique styles are extremely popular when it comes to engagement ring designs and there is a vast selection from all the different eras. Whatever your personal style is you will probably be able to find an antique ring that suits your tastes. One of the more popular time periods for antique rings is that of the Edwardian Era. Jewelry from this period is classic and traditional, as well as very feminine. While the name ‘Edwardian Jewelry’ may not be commonly known, I guarantee you the style is. It has a timeless appeal, which is the reason it remains in high demand today. The Edwardian Era began in England in 1901 when Queen Victoria died and her son Edward took the thrown. The period ended in 1914 with the start of WWI. In France, the same period is referred to as ‘The Belle Époque’ or the beautiful age. King Edward and his Queen Alexandra were fashion leaders who helped established an international high society throughout Europe. This era is considered a romantic and elegant age, but it was also a time when the class system was rigid, and a huge gap in wealth existed between the high and low classes. Wearing fine jewelry was a necessity for those in high society, and it was worn to show one’s rank and wealth. While today it can be considered vulgar to flaunt extreme wealth, in Edwardian high society it was a requirement. One of the defining features of Edwardian jewelry is the use of platinum. In 1903 the oxyacetylene torch was invented, which reached the high temperatures needed to melt platinum. Because platinum is one of the hardest and most durable metals, very delicate and intricate designs became possible without worry of breakage. 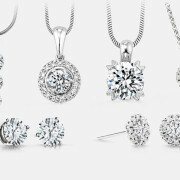 Platinum is also excellent for setting diamonds, and the use of diamonds was widespread throughout this period. Another important feature in Edwardian jewelry is the technique of milgraining. This is when a small border of beads is created to surround the gemstones and follow the edges of the design. Miligrain adds a lighter and softer appearance to the metal. Inspiration for the Edwardian style came from traditional motifs of the past. Neo-classical and Rococo artists of the 18th century, as well as the French courts of Versailles were all influences. The famous jeweler Cartier had his designers wander the streets of Paris looking at 17th and 18th century architecture for inspiration. Pattern books featuring ornamental designs from the past began to circulate widely during this time, and this was also reflected in the jewelry. Popular motifs were garlands, ribbons, wreaths, bows, knots and lace, which were all created with an airy lightness that platinum provided. Ladies in the early 1900’s wore silk and lace dresses in pastel colours, which matched the elegant platinum and diamond jewelry. Diamond ‘dog collars’ became hugely popular, as did black velvet chokers with a diamond motif in the center. Queen Alexandra would pile many jeweled chokers upon her neck, said to be hiding a scar from her childhood. Soon enough all the royal ladies and those in high society were copying her style. Brooches were typically worn on the dress until about 1910 when changing necklines led to the wearing of necklaces with one or two hanging pendants. 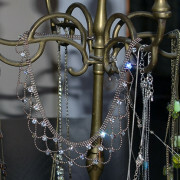 Earrings were long with open work design that reflected the flowing gowns. Tiaras were an essential part of the elite lady’s outfit, and platinum allowed for elaborate design without being too heavy on the head. Rings had large center stones surrounded by smaller stones. Multiple stacked rings on the finger were also very trendy. Rings had elongated outlines, pierced work and filigree design. Some rings were so large they covered the finger from knuckle to knuckle. Women often wore their engagement rings on a different hand than their wedding band, as the engagement ring’s size and shape didn’t fit with a band. This age of elegance abruptly ended in 1914 with the start of WWI in Europe. Platinum was needed for the war effort and jewelry production in Europe came to a halt. No longer could royalty and high society flaunt their wealth so freely when the entire country and continent was under fire. The jewelry industry did recover after the war and by the mid 1920’s the Art Deco style became all the rage. While the Edwardian era lasted for less than 15 years, its light and elegant designs remain in style today. 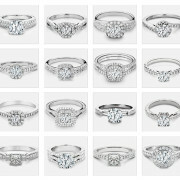 For today’s engagement rings, the white metal and white diamond style is definitely the most popular look. Many elements from antique Edwardian rings are still very common, such as milgraining and small diamonds surrounding a larger one. It just goes to show you that, like most fashions, when it comes to jewelry – what goes around, comes back around. 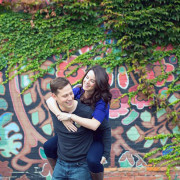 Sara is the Jewelry Production and Social Media Coordinator at Kimberfire – a brilliant way to buy engagement rings, fine jewelry and loose diamonds in Toronto. She holds a Bachelor of Fine Art from York University and a Diploma in Jewellery Arts from George Brown College. She is skilled in jewellery design using CAD software, as well as traditional goldsmith techniques. When she is not immersing herself in all things jewellery, Sara is a dog mom to Barley, her beagle mix rescue dog who loves a good tummy rub. Diamond Grading Certificates: Are They All Created Equal? 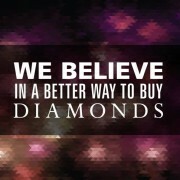 A brilliant way to buy engagement rings, fine diamond jewelry and loose diamonds in Toronto, Canada. View and inspect your carefully selected diamond in our private and comfortable offices, right in the heart of the city. Am I Ready to Propose?